Saturday it was raining, it was pouring but there were no chess players snoring as they intensely battled over the chess boards at the July LaVerne Park Chess Tournament and Water Fest. Apparently rain does not scare chess players away as this tournament had one of the largest turn outs seen so far at the LaVerne Park Summer Chess Tournaments. Vincent Robertson, a fifth grader from Texas, was visiting grandparents and after hearing about the tournament on the radio, wanted to play. David Chung, an adult from Albany was attending a family reunion. Family members knew of his interest in chess and informed him about the chess tournament. Philip McNiel, a college student from Powers had only played chess on the computer and was looking forward to playing chess “live”. Colton Hinman, 10th grade from Myrtle Point, knew of the Coquille Chess players reputation for being tough players to beat but was looking forward to the challenge. With rain pouring from the skies, picnic tables were huddled under two shelters to stay dry. 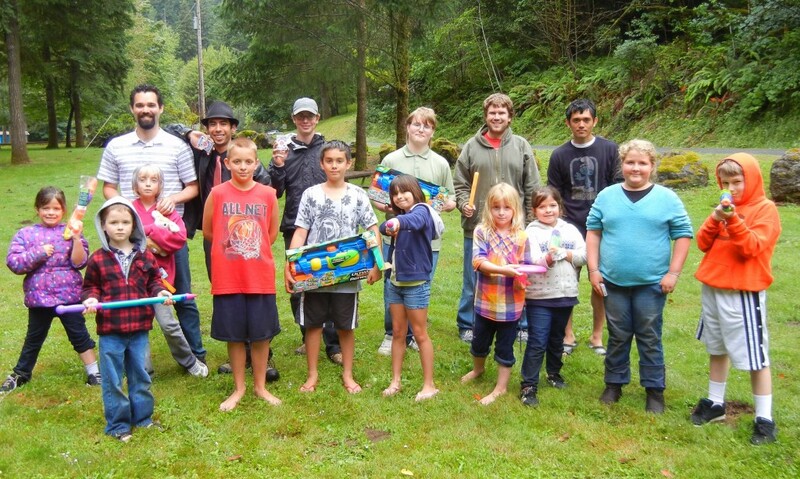 But between rounds, kids were in the river exploring, catching crawdads and salamanders, and enjoying the warm rain. Six players were selected for the elite division with their ratings over 1000. Adult brothers Jeff and James Sperling had to battle against each other in the third round, with Jeff the victor (this time at least). Aaron Grabinsky, Coquuille eighth grade, was paired against Mark Claiborne (adult and toughest known chess player in Coos County), in the first round and it was a brutal war. They eventually ended in a draw. Then both beat all their other opponents and tied for first place to win the cash prize. The other seventeen players were pitting against each other in a five round non elimination swiss sys system. Philip McNiel ( adults from Powers) was undefeated but was impressed at the tough “live” opponents that made him work hard for that success. Judah Avery (adult from Bandon) won second place and Colton Hinman (10th grader from Myrtle Point) showed he could take on the challenge of Coquille players as he placed third. Coquille first grader, Mackenzie Collard showed her possible prodigy skills as she placed sixth behind three adults and two older kids. Prizes of squirt guns, bubble wands, frisbees etc were distributed and the park was quickly deserted as wet kids and adults figured that was enough rain for one day.